Arsene Wenger made a successful return to football management in England…by winning silverware at lowly Barnet. 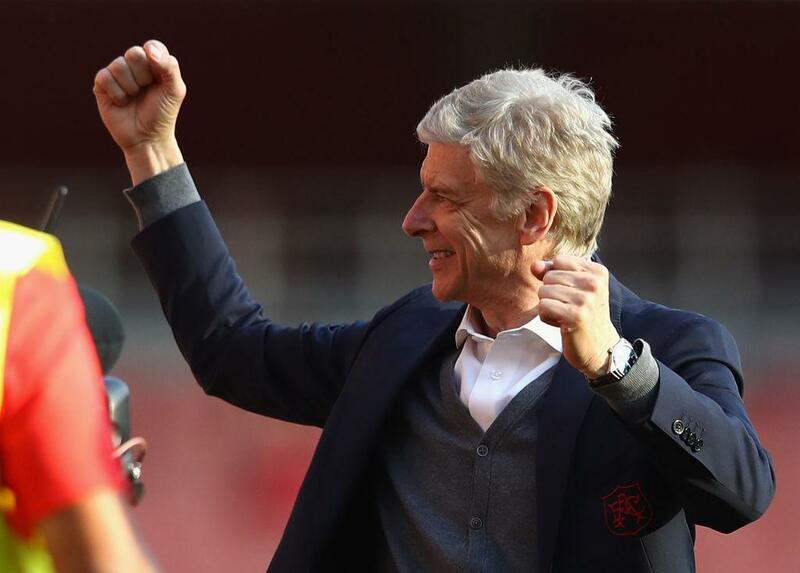 The 68-year-old sat in an English football dugout for the first time since leaving Arsenal in May after 22 years in charge of the Premier League club. The Frenchman took charge of the second-half action at the Hive stadium in North London as a Premier League Masters XI side beat the African Masters 9-4. It proved to be a triumphant comeback as Wenger, who took over when the Premier League side led 3-1 at half-time, lifted the inaugural Petrolex Kanu Cup. It was his first trophy since the 2017 FA Community Shield. The charity match, in aid of the Nwankwo Kanu Heart Foundation, involved former Arsenal stars Kanu, Sol Campbell, Robert Pires, Jens Lehmann, Lauren, Emmanuel Eboue, Kolo Toure, and Wiliam Gallas. This was Wenger’s second coaching comeback this summer — he was in charge of a Fifa 98 team which were beaten 3-2 by a France 98 side in June. Wenger, who lives close by to the National League outfit Barnet, would be open to taking up another hotseat, saying he had he has had job offers “more than I expected” since his exit from the Emirates. Last week he revealed he had not watched a single game since Spaniard Unai Emery took charge of the club which he transformed when he arrived in 1996. The Petrolex Kanu Cup in association with Masters Football aims to raise money for the Kanu Heart Foundation and provide children in Africa with life-saving heart operations. To donate to the Kanu Heart Foundation, text KANU25 followed by the amount you wish to donate, to 70070.